In this tutorial, we cover the new questions you can expect to see in your next IELTS Speaking exam. Every quarter the examiners get a new list of question topics. In this tutorial, I share sample answers with instructions and tips to help you improve your score. Below are the topics and the sample answers. This week there are three podcasts! 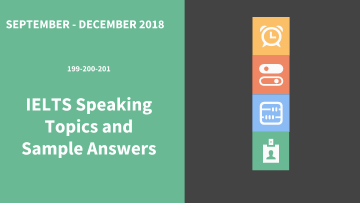 All about the new speaking topics and sample answers. If you have your speaking exam soon check out the new IELTS speaking packages. Thanks for the wonderful feedback, Ismail! If you need further help in IELTS, just let me know and I’ll give you more tips.